Those planning to register onsite should expect unforeseen delays and congestion. We recommend advance registration for Neuroscience2014 to ensure a smooth registration process, and offer a discounted registration fee for Early Bird Registration. Persons who reside in Japan registered by August 18th (Mon) will receive a name card, registration receipt and a program voucher in early September. Persons from overseas can collect their name card, registration receipt and program at the registration desk. Please note that the program will not be sent via mail prior to the Meeting. Please select your Registration Category in the Meeting in accordance with what your official status will be at the time of the Meeting (September 11-13, 2013).You may be able to cover your registration fee through grants (Grant-in-Aid for Scientific Research, etc. ), when you present the research results with their support at Neuroscience2014. For more information, contact your administrative office. Normal Registration is now closed. If you are not a member, please follow the appropriate registration steps and upload a valid student ID with a clearly marked date of expiry when registering. If you register on site, please present a valid student ID at the reception desk. If you are not a presenting (first) author of an abstract and will not be attending the reception、the registration fee is free of charge. Please present a valid student ID at the registration desk to receive your name tag. 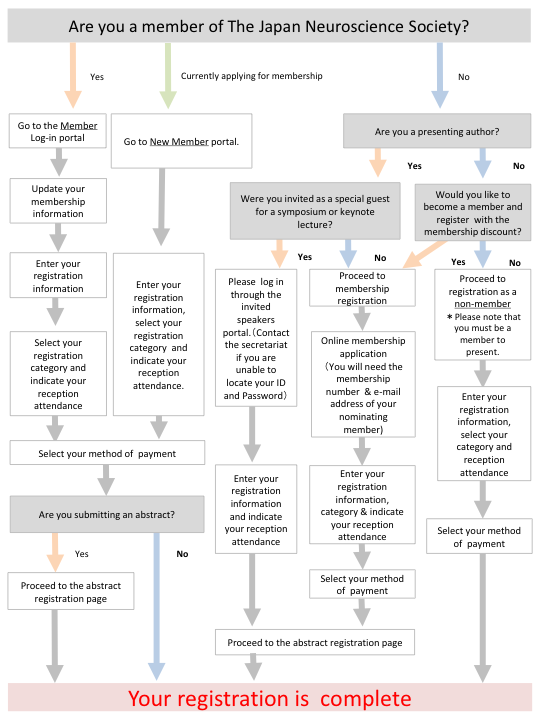 Advance registration and fee payment (JPY 1,000) is required for fist presenting authors. This reception offers the opportunity for promising undergraduate, postgraduate students and post docs to meet with leading researchers in a friendly atmosphere. Participants may have the opportunity to speak with the plenary lecturers and symposium speakers. We encourage all to take advantage of this opportunity. Advanced registration will be processed online. You will need Registration ID and Password to confirm or amend the details of your registration. Be sure to keep them safe. If you are already a member, your membership number will be your Registration ID. In order to submit presentation abstract, you need to complete advance registration at first. When you choose yes / no to Reception participation at online registration, your payment will be automatically summed up. Only credit card is acceptable for the English version of the registration. When registration is completed, the auto-reply mail will be sent to your registered e-mail address. Please fill out and submit an on-site registration form placed near the registration desk to the registration desk. Onsite registration will accept cash only. Depending on the number of participants registering on site you may be asked to wait. To avoid congestion at the registration desk, we strongly recommend you complete advance registration online and take advantage of the discounted fee. For participants who reside outside of Japan, you will receive your registration confirmation via- e-mail. Please print and present your registration confirmation e-mail at the registration desk for“International pre-registered Participants” and receive your name card, payment receipt and program. Participants who opt for on-site registration will be provided with their name card, receipt and program after their registration fee has been collected in cash. It may take up to a week to issue your membership number. Please apply for your membership in advance. In the event that you are unable to register your membership in time, please select the “New Member” section. Make note that registration is mandatory and must be completed before the meeting.